Titanium fifth wheel, one of the few products that deserves its name. You can take Titanium fifth wheel along, everywhere you drive...nothing tows like it ! Titanium fifth wheel is a member of the big family of commercial products available today that chose to use “titanium” as a marketing vehicle. If “fifth wheel” doesn’t ring any particular bell to you, we’re talking about a caravan or camper, or if you really want to be formal, a recreation vehicle (RV) equipped for camping out while traveling. Glendale fifth wheel is commonly refered as titanium rv. It’s that big think towed by a truck that you often meet with on the highways. Fifth wheel comes from the association with the spare tire found in regular cars. Titanium fifth wheel is one such RV produced and manufactured by the Canadian based Glendale RV company, an industry leader in the recreational vehicle market. According to their estimates, there are more than 120,000 units registered and in use worldwide, especially in North America. 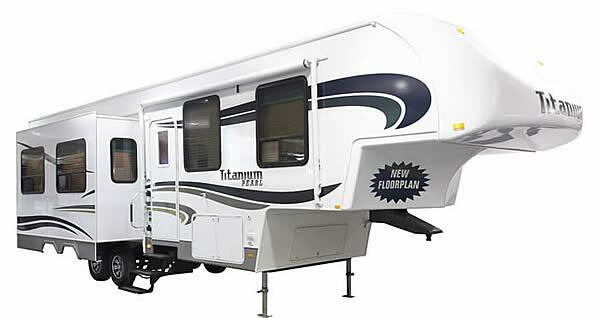 As titanium is the prince of the metal category, so is Titanium fifth wheel for the caravan industry. Although, to my knowledge, no significant quantities of metal are used in manufacturing the product, this particular application can proudly use “Titanium” in its name as it has several distinctive advantages over its competitors. For instance, Glendale uses for the titanium rv a unique design approach that single-handedly addresses several critical key points for the campers. The design has two distinct strong-points. The first regards the positioning of the pin box, that permits more of the RV interior layout to be positioned forward of the truck rear axle, making efficient use of the interior space and allowing Glendale’s titanium to be 15% shorter in tow length at the very same overall length of any competitors. The second is the aerodinamyque design of the front cap that gives Glendale titanium rv a distinctive, easy to recognize, classy appearance. It also contributes to significant fuel savings reduction of the tow vehicle, which is something worth accounting, especially with the current fluctuating oil prices. The reduction of fuel cost is due to the minimal air resistance provided by the front cap, and a side benefit is the reduction of wind drag and an exceptional road handling and stability. To further enhance the bond between the intrinsic meaning of the brand with the product itself, Glendale uses only top quality materials for the finishing of the interior space and for other indoor systems such as air conditioning, refrigerators or furnaces. “Nothing tows like titanium” fifth wheel. It’s the company slogan. And it’s actually a true one. UPDATE: As of 19.01.2010, following a board of directors meeting Glendale International Corp. made a decision to file a voluntary assignment in bankruptcy under the Canadian Bankruptcy & Insolvency Act, which means production of the titanium rv is left to an uncertain future.